When it comes to fresh made pasta, you can either make it with a pasta machine or by hand with a rolling-pin. 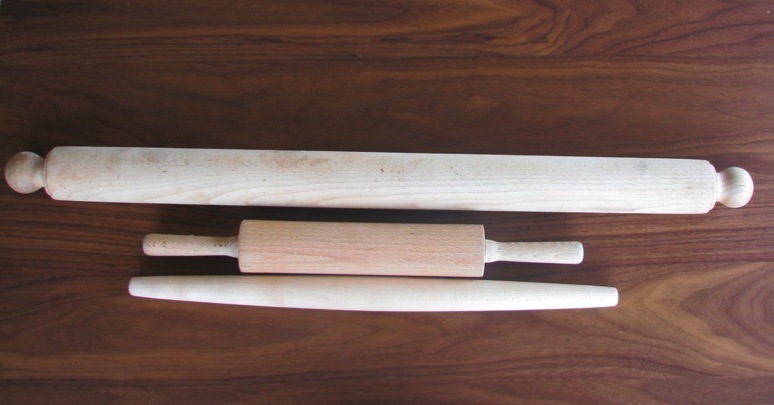 In Italian that rolling pin is called mattarello. Since, I broke my machine, I decided to go back to the more traditional way of pasta making and using a wooden mattarello, but living in San Francisco and not in Italy, mattarellos for pasta are hard to find, they’re not like the traditonal rolling-pins but thicker and longer (with no handles) so you can spread your pasta in a big circular and thin sheet. I found a huge mattarello at Lucca’s on Valencia. It was hanging from the ceiling with the salami. So for $13.99 I decided to buy it, the beast is 70 cm long and has a diameter of 6 cm. I thought if it’s too long for my hands I can always use it as a defense tool – Anyway, it works fine and thins pasta sheet like no other mattarello. Home made pasta with a mattarello tastes much better. The pasta turns out more grainy and that enables to absorb the sauce much better than when made with a machine. I remember my grandpa who would not even touch pasta if it was made with a machine, he only ate pasta rolled with a mattarello. I think that is a little extreme but that generation of men were that way. The technique takes a while to master, because the sheet needs to be thinned equally from the center to the edges, so it takes some practice before making great pasta with a perfect texture and thickness. This entry was posted by silvia on December 3, 2008 at 4:44 pm, and is filed under Misc Articles. Follow any responses to this post through RSS 2.0.You can leave a response or trackback from your own site.